This being the end of the year, when we normally take stock of things, I have been sitting here working on an update on how the Leonard Pennario book is going. Above is a painting of me working on my update. The plan is to enclose this screed with Christmas cards I am sending to friends of Leonard's and also people who have helped me with the book, granting me interviews, bringing me coffee, encouraging me, etc. I would also like to zing this update to the 183 people who have demonstrated their good taste in music and life by joining my Facebook group, "Leonard Pennario, America's Greatest Pianist." 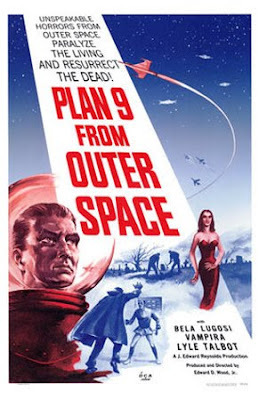 What about Plan 9 From Outer Space? My plan is almost as complicated as that! That line about paralyzing the living, that hits home, I will tell you that right now. Because I am sitting here paralyzed as dawn is breaking. Zut alors, I cannot write! All I am trying to do is put together this little newsletter, I guess you could call it. It is almost like a Christmas newsletter. That is what I have been telling myself. But I have never written a Christmas newsletter. How do you start it? Then for some reason everything comes out convoluted. So I thought if I confided my difficulties on this Web log it would loosen me up. The plan is to publish the book in 2010. Plans are in place to publish the book in 2010. By the time I figure out just this one sentence the sun will be high in the sky. I am sitting here thinking, this is the goofiest thing. I have no problem getting up and pouring my coffee and sitting down and knocking out a whole chapter about Pennario's first year with Capitol, his studies with Isabella Vengerova, his collaboration with Jascha Heifetz, all kinds of arcane and complicated stuff. But try to write a chatty little newsletter and oh, that paralyzes me. Perhaps the secret is to write the update here and then I can cut and paste. Perhaps the secret is to go downstairs and eat something. Maybe I should take a shower. How about that snowstorm that hit every other city but missed Buffalo? How about that health care bill Congress is ramming down our throat? What about my clean bedroom? I should put that in the newsletter, that I cleaned up the bedroom. I must get this done! Yes, 'What about them...', a very good question. I must remember to never again read this blog while eating my breakfast, a dry peanut butter sandwich. The inevitable laughter almost choked me this morning! :) Pass the Windex. I understand at how much work is involved in writing a book. But how come Sarah Palin wrote her book so fast? You been working on it since before anyone even heard of Palin and she did it while being the gov. and watching those pesky Russians in case they start attacking us. Well by the time your done Sarah's book will be on the 75% off shelf at borders. 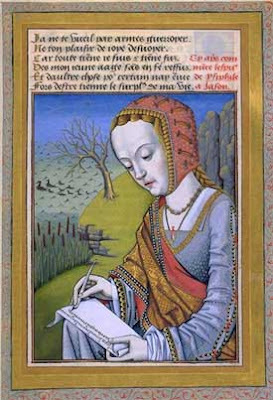 Is there a patron saint of frustrated writers? If so, how did he or she over come their writers block?? I have found that it is sometimes easier to just dive into the subject matter, then once you have started writing, the perfect opening lines and paragraphs will naturally come to you based on what you have written thus far. Larry, Bingles and Anonymous, thanks for the nice words! Anonymous, Sarah Palin was able to write her book faster because it is a memoir and she did not have to track down a lot of sources to interview or dig up letters and concert reviews, which, I have had to do a lot of that. I want to read her book. I hear it's good!